One very useful thing when trying to write a blog about development and other geeky stuff is to display code... . Unfortunatly, as far is I know, Blogger does not have a -decent- feature for this. You can add code using <code>-tags, but I prefer syntax high-lighting since it makes code much more readable. The easiest way to install this is to implement it directly in your Blogger template, so it's always there when you need it. Go to the home page of your blog. Click "Template" and find the link "Edit HTML". You'll be given a warning that this can be tricky, so you might want to save the current template first. In the HTML code, look for the </head>-tag and add the code below, right above the </head>-tag. Create a new blog post and use <pre>-tags to add code, as you can see in the code below. When you hit Save/Publish/Preview you should now see some very cool syntax high-lighted code! My first response to seeing the final result was: "where's my 'copy-to-clipboard'-option?". So, if you're wondering about the same thing: it's in there, you just need to know how to find it :) Just double-click the code and it will be selected without line numbers and in a structured format. Ctrl + C and you're set! 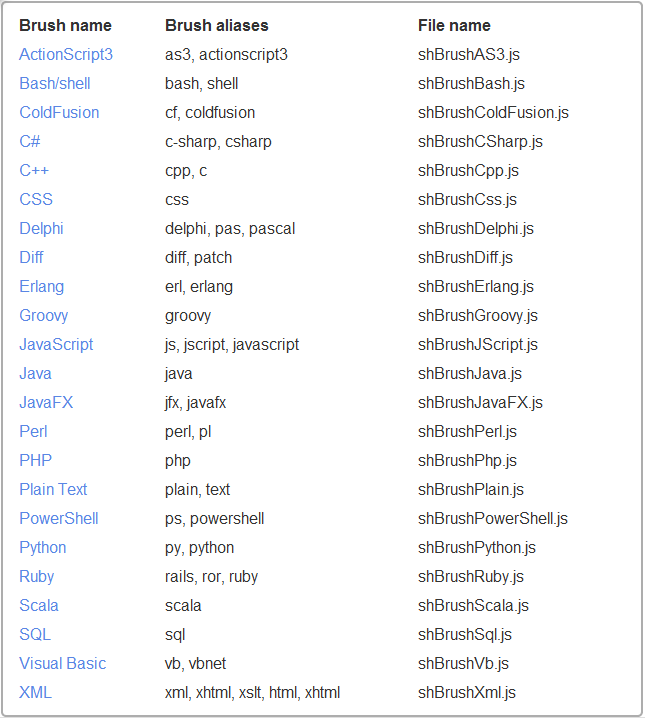 I've added this list of which brushes fit with which syntax as a useful reference. 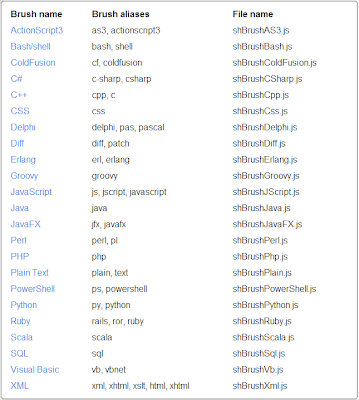 This also has extra info about configuration, the available brushes, themes for the code view, ... . I recently noticed an issue with the syntax highlighter that only seems to occur in the latest version in Chome, you can find a fix for this issue here: http://www.thiscouldbeuseful.com/2012/11/fixing-syntax-highlighter.html.